This past Saturday, I went to the HARDfest Day of the Dead electronic music festival. Alone. And it was amazing. I'll write about the actual festival in another post, but I thought maybe first I should address the obvious weirdness of a thirty-seven year old woman who goes to trance fests - and usually by herself. I imagine that might raise an eyebrow or two, because duh. And I totally get it. If I wasn't me, I'd probably give me the side eye, too. So I'll try to explain why I do it. For one thing, I never experienced festivals in my teens or twenties. 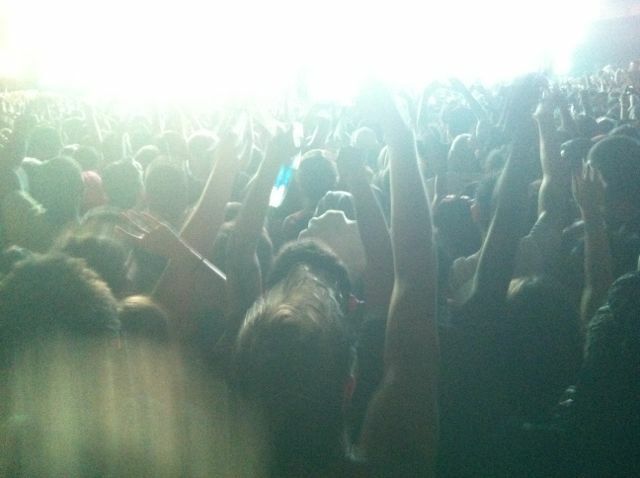 I wasn't exposed to electronic music much at all; there certainly weren't any events like this coming through Tucson. There weren't even any good places to go dancing. It wasn't until I came to LA and befriended my gays (and I use that expression with their blessing) that I had the opportunity to go dancing regularly, and to really appreciate dance music itself. I've always liked to dance, but my gay friends taught me to really, really love it. And to do it well. I try to be a pretty modest person in general, especially when complimented on things other people perceive as my talents - but I will totally, immodestly own being an awesome dancer, because I learned from the best. I learned everything I know from men who can move. They're also older than me by a few years. So from the beginning, I never had any hang ups about my age, or any idea that I was "too old" to go out. I'd say half the crowd in West Hollywood is over forty, anyway. My gay friends are as fun-loving and free-spirited as teenagers. They don't think twice about being in their late thirties or early forties, and partying until the wee hours. They lead responsible lives, and are creative, productive professionals. They just know how to have a good time, and their lust for fun rubbed off on me. Also like me, they have only themselves, their pets, and their partners to consider, when it comes to how they spend their time, money, and bodies. Anyway, the first time I went to an electronic/dance/dubstep concert, I was hooked. It was the perfect way for me to unplug from life and completely dial into music, which is a huge part of my emotional expression to begin with. I fell absolutely in love with the sound itself, and the ways it moved me, mentally and physically. And it didn't bother me that I was at least ten years late to the party. I just knew that having finally found it, I didn't want to leave it. I'm definitely aware of being, oh, about fifteen years older than the average attendee, and there are moments where that can be a little awkward (and I'll expand on that in another post), but I still feel, most of the time anyway, youthful enough in spirit and body to enjoy myself. Finally, one other detail that lent itself to my perfect storm of loving trance festivals - I discovered them during the time I experienced a lot of personal trauma: the deaths of my parents, my divorce, the loss of some close friends. So it was the ultimate escape from all of that. It still is. As far as going alone, this is probably weird or even unbelievable to a lot of people, but I actually much prefer it. I become so entrenched in my own experience that I'd rather not have to worry about anyone else's - if they're having fun, or if they need something, etc. I completely understand if it sounds hyperbolic or like emo-juvenile-new-age-baloney, but it's a spiritual experience for me, in a way (like Diane Ackerman's concept of "deep play"), and I like to have it alone. It's a way to reconnect with myself. It's one of the few times that I feel like I find clarity and feel inner peace. And it's just ridiculous, incredible fun.